First step toward a terrarium is to find a container. No need to shell out the contents of your wallet. And no need to purchase an expensive unit. 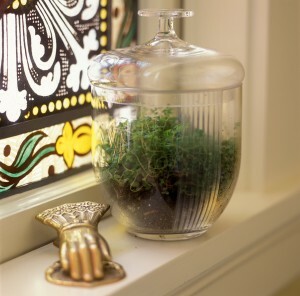 The beauty of terrariums is that you can make a small world without a big investment. You could wander into a HomeGoods store or some such place and pick up a perfectly budget-priced sparkling sleek apothecary jar and it would do the job beautifully. Or how about rummaging in your basement, attic, garage, barn or wherever you stash yesterday’s castoffs and pull out a fishbowl, aquarium, cookie jar, or vase. Can’t find a lid? Fit a glass plate on top! In other words, rather than trying to shop for a terrarium — just enlist what you’ve got kicking around. Planting and maintenance of your terrarium will be so much easier if you can fit your gloved hand into the container in question. A container with a base that is at least 3 inches wide will give you sufficient planting space to make it happen. Expand that base and you can feature a more complex small world. For headroom, the height should be at least 6 inches to accommodate the base pebble/charcoal layer, the soil layer, and the plants. Deeper is better. 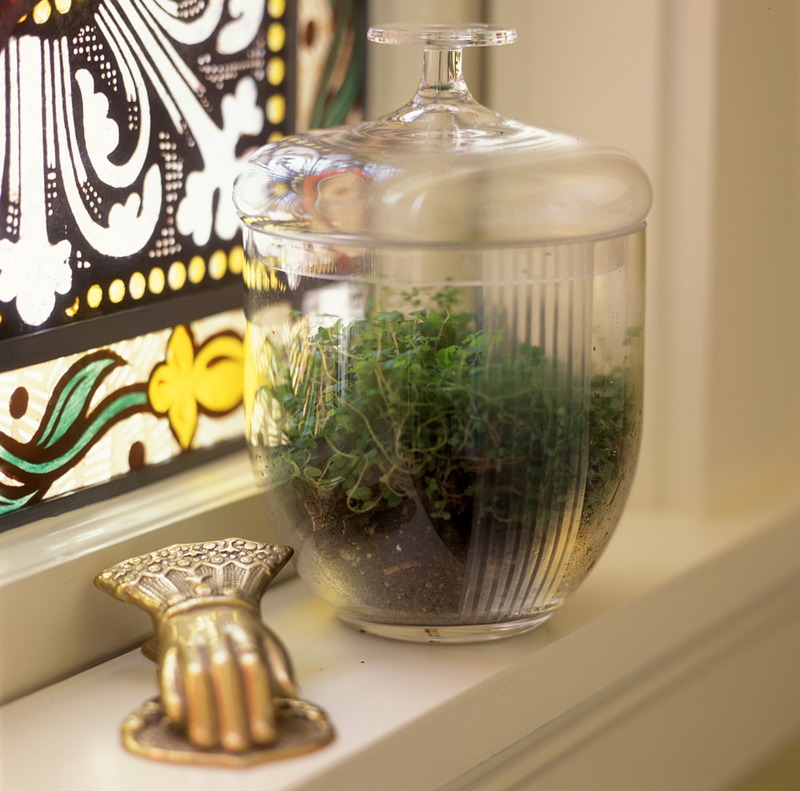 Clear glass works like a charm, but lightly tinted glass is also apropos, although you might have to position the terrarium a little closer to the light source for growing purposes. Plastic is okay (especially for classroom use) but the sparkle will be dulled and the finished terrarium might require airing out more often. If a container is open to the air, it will require watering more frequently than a closed terrarium. So be creative and hunt around. Find a venue that expresses your inner mini gardener. Found something funky? Give it a try! What’s the worst that can happen? Have questions? Ask away! I’m here for you. This entry was posted in Making Terrariums. Bookmark the permalink. I recently saw an article about your book in the newspaper and have been inspired to make a terrarium. Unfortunately, being UK based I cannot easily come to your workshops… what plants would you recommend are best for a pretty first-time terrarium? Delighted that you’re catching the contagion, Victoria, and congratulations on your royal wedding day. Tell you what — the next post will be about selecting plants. So stay tuned = should be up by next Wednesday. And unofficially, it’s possible that I might be doing workshops in the UK — I’ll keep you posted. Absolutely, Analinda — most orchids work really well in terrariums. Depending upon the size of the terrarium, you might have to look for miniature orchids and they grow best in an orchid-growing medium rather than potting soil. Good luck with it! Where are your workshops located at? I would like to attend one. Check out my newest post, Carolyn. I hope that you can find a terrarium lecture or workshop near you. Keep an eye on updates — I add lectures/workshops all the time.